This article will be of great help to all those dog lovers out there, since many of us just do not know what is beneficial, and what is harmful for our favorite pets. Therefore, this has been resolved finally, so you are given the list of all healthiest dog foods. Fish is extremely beneficial since it is high in omega 3 fatty acids. These fatty acids keep your dog’s coat shiny and healthy. It’s high in proteins and vitamins as well. Feeding your dog with salmon and tuna will support your dog’s immune system. Dogs love cooked salmon and you can even add salmon oil to their food. Although tuna is known as a cat snack, you can also give this healthy meal to your dog. The lean meat is highly beneficial, and numerous vets have improved it, which means that through its consumption, you give an extra quality protein to your dog. It’s a great source of amino acids and B vitamins. These vitamins are involved in maintaining great energy in your dog’s metabolism. Thick chicken, pork or beef with no visible fat and added seasonings or sauces is a great training treat. Similarly to lean meat, the liver is a great training treat and can also serve as a meal replacement. This meat is known as a great source of B Vitamins, Vitamin A and Vitamin K, as well as iron. You can buy it fresh from the grocery store to feed your dog at home and you can cook or bake it. Also, you can find it in most pet stores in freeze-dried form. However, be careful and limit the amount of liver that you give to your dog, since too much liver is toxic for your dog. No more than 1g of fresh liver /Kg body weight a day. Oatmeal is rich in fiber, which is needed by your dog. It’s great for older dogs who suffer from bowel irregularity issues. Cook it before serving it to your dog. If your dog is allergic to wheat, oatmeal is a great substitute. Sweet potatoes are safe for your dog, so you need to slice them up and dehydrate them before you feed your dog with them. They are a great source of Vitamin B6, Vitamin C, Beta-carotene and manganese. Eggs are great for dogs’ diet and they will welcome additional protein boost. Parsley is a good source of beta-carotene, potassium and calcium. Aside from that, it improves your dog’s breath, for it clears the “stinky breath”. Add few tablespoons of chopped parsley for extra flavor and color. Let your dog eat pears, but remove the cores and seeds, as they can be toxic. Cut a pear up, throw the core away and feed the eatable pieces to your dog. Cheese is high in fat, so opt for some that has low or reduced fat. Cottage cheese is a great choice. It’s high in calcium and protein. However, make sure your dog is not lactose intolerant before you add this snack to its diet. Just like cheese, Greek yogurt and kefir are high in calcium and protein. Yogurts without active bacteria are good for the digestive system of your dog. Nevertheless, always choose yogurts that do not contain added sugars or artificial sweeteners. Popcorn is a low-calorie treat. It contains potassium and bone-building minerals like calcium, magnesium and phosphorous. If you want your dog to join you for a tasty popcorn treat while you are watching a movie, cook some with no butter or salt. Flax Seed is a great source of omega-3 fatty acids, which are great for the skin and coat of your dog. Whole flax seeds are also quite healthy for your dog. Go rancid before you feed your dog up with whole flax seeds. Flax oil is a better source of omega-3 acids, since they are more concentrated there, but it lacks fiber. You should store the oil or seeds in the fridge in an airtight dark container. Peas are a great source of potassium, phosphorous and Vitamin B. Add them to your dog’s diet, frozen or thawed. This vitamin-rich veggie is a great nutritional boost for dogs. However, you need to make sure it is no more than 10% of your dog’s diet. If your dog overeats it, there is a possibility for gastrointestinal irritation. Baby carrots are great low-calorie snacks and high in fiber and beta-carotene, and are beneficial for the dog’s teeth. Beans with no added salt are a great low-calorie snack. This dried edible seaweed is rich with protein, fiber, Vitamin C, E and all forms of B Vitamins, as well as minerals like copper and zinc. It will regulate your dog’s metabolism with sterols and chlorophyll. Apples are a good source of Vitamin A and C and fiber. Feeding your dog with apple slices will clean the residue off his teeth, but you must take out the seeds and core before you feed it. You don’t want to risk him getting choked. The health of your dog can be undoubtedly improved by consuming fruit salads. Make a fruit salad using cantaloupe, apples, bananas, watermelon, strawberries and blueberries. Coconut and coconut oil are both highly beneficial for people and dogs. Coconut contains Lauric acid, which when consumed by dogs, produces monoglyceride monolaurin, which destroys pathogenic bacteria and different forms of viruses. Moreover, coconut contains albumin, which is a water-soluble protein that can be found in many animal liquids and tissues. Be sure to take care for your dog just like you care for your health. Choosing the right food for your dog will make it healthier and happier. 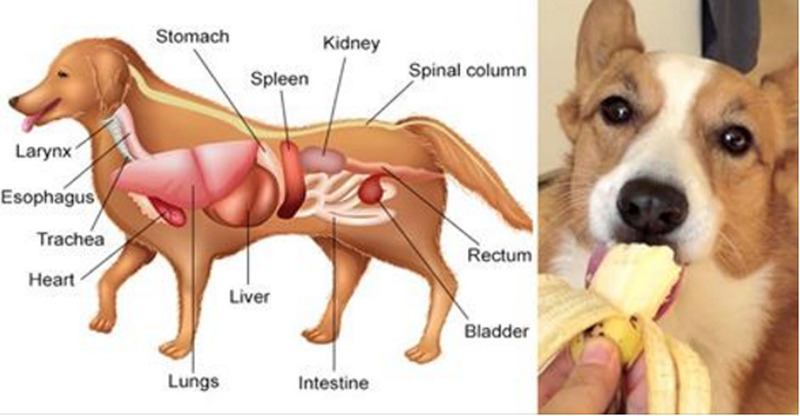 Moreover, take care that apart from all these beneficial foods above, there are others which should be avoided, as they could harm your dog’s health.